Chickice? What does she want now? Angrily she shouts it again, and again. Luckily Indah gets it. 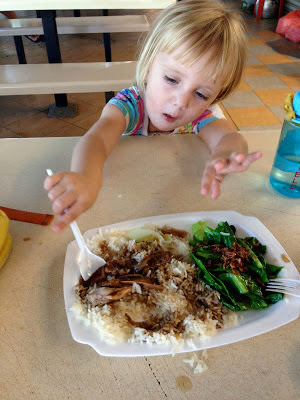 Jasmijn wants chicken rice. Our Jasmijn is turning into a real Singapore Girl. Chicken rice might well be the most popular dish in Singapore, and is loved by all our children. Whenever we eat in hawker centres, where mama and papa gorge on exotic goodies, this is one of their favourite choices, alongside Malay sateh and Indian thosai. Chicken rice has all those properties that make it attractive to young children. It is white. Mild flavoured. All components are easily identifiable. And it does not contain any vegetables apart from some pieces of cucumber. 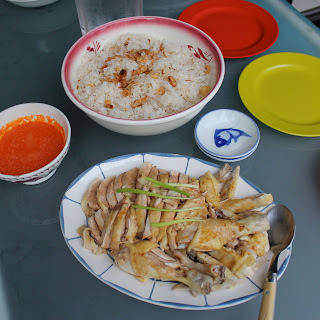 For precisely those reasons I used to think chicken rice boring. But, the more I eat it, the more I start to appreciate it. The soft, yet fragrant flavours. The creamy, crumbly rice. 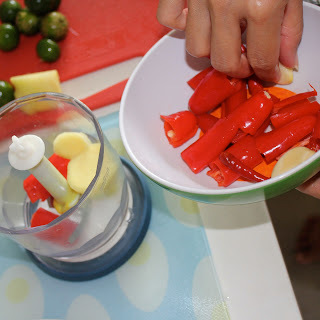 The spicy, fresh chilli sauce with ginger and lemon. It was about time to try this at home. Boiling chicken is not something we traditionally do in Europe, unless we make soup. But when you think about it, it has many advantages. The chicken will turn out juicy and plump every time, you cannot cook it too long, no risk of dryness. And there is a lovely chicken soup the next day. As with all famous dishes there are as many recipes as cooks. Google showed particularly helpful, and after some surfing the dish started to unravel its secrets. So I had a plan, a chicken, and a sick Jasmijn in need of some broth. Unfortunately that same, sick, Jasmijn decided to be stuck to me like glue, so handling of boiling liquids proofed possible. Again, Indah saved the day. It turned out she had cooked the dish many, many times before, after her former Chinese employer thought her the family recipe. Indah could cook chicken rice with her eyes closed. And so she did, while I hovered around, clutched by a moaning toddler, making notes and pictures. The quantities in the recipe are not precise, feel free to adapt them to your personal taste or the size of your chicken. Not all the stock is needed for boiling the rice, the remainder can be used for chicken soup. To make it stronger you can add the bones after you have cut up the chicken and boil it a little while longer. Wash the chicken and rub it with salt. 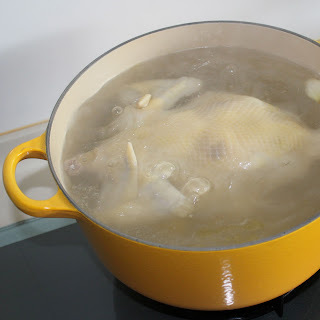 Boil a large pot of water, enough to just cover the chicken, not more. 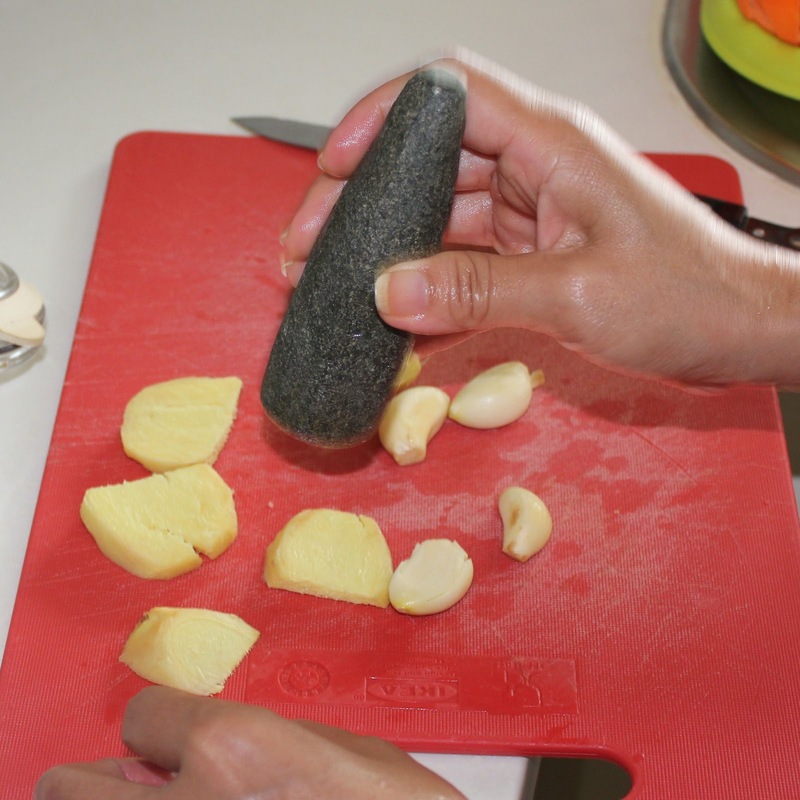 Peel the garlic, lemongrass and ginger and pound them to release the flavour. Stuff half in the chest cavity of the chicken. When the water boils, put the chicken and the remainder of the spices in the water, put the lid on, and bring back to the boil. Turn off the heat and leave for about 45 minutes. If you want to you can turn the chicken halfway, and bring the water back to the boil. 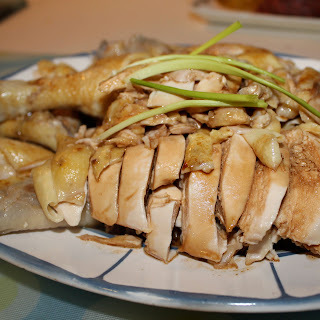 You can check the chicken by sticking in a chopstick, if the juices run clear it is cooked. Take it out of the stock and leave to cool. Heat some oil in a wok and fry the finely chopped garlic. 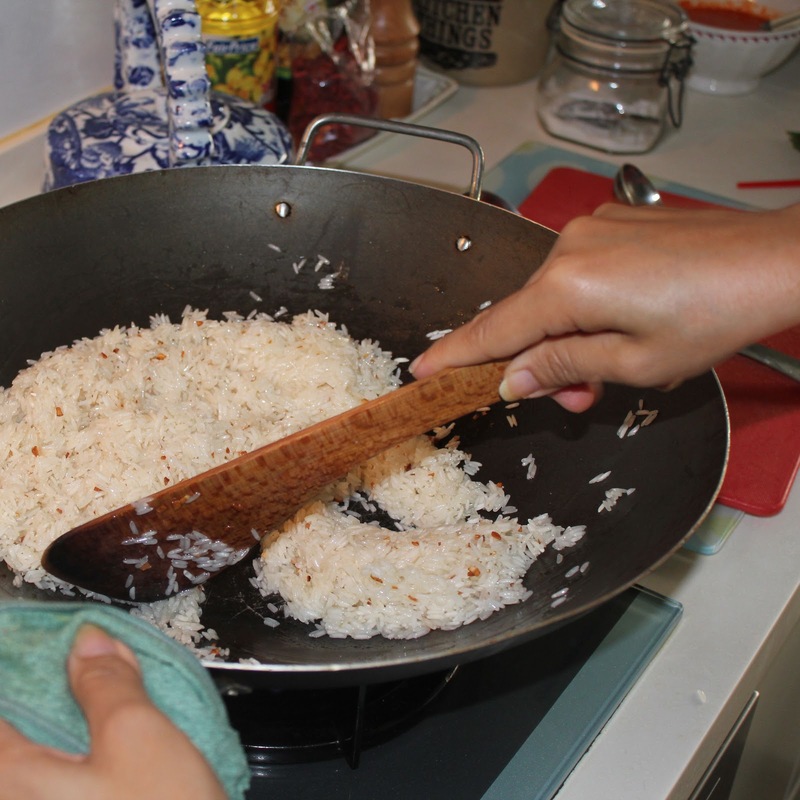 Add the dry, uncooked rice and fry till it is coated with garlicky oil. 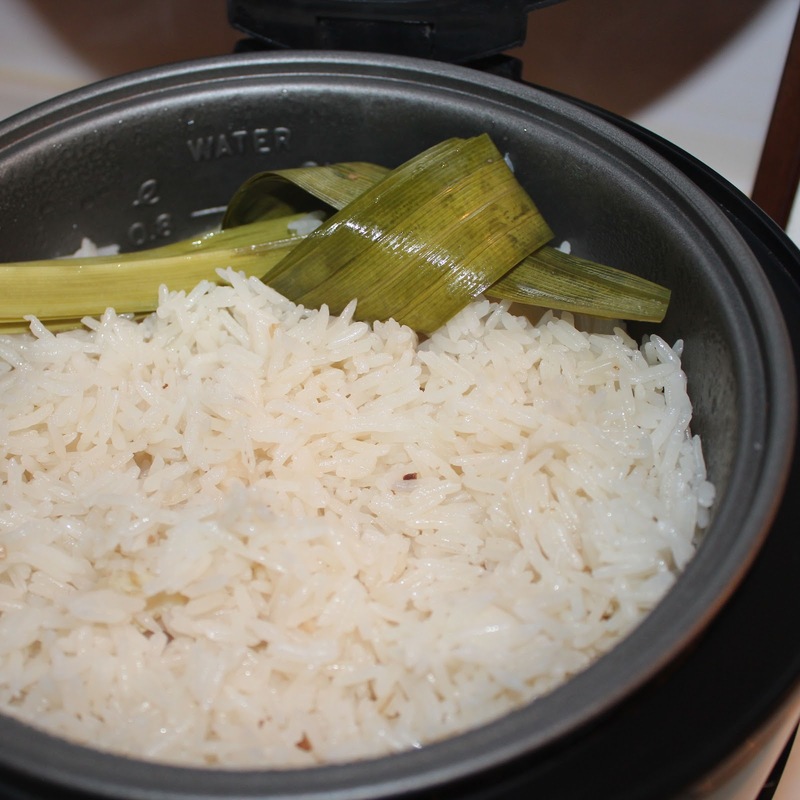 Transfer to a rice cooker or casserole together with the stock, ginger and pandan. Boil until all the stock is absorbed and the rice cooked. Puree, chop or pound all the ingredients to a smooth sauce. Add a few spoons of the top layer of the chicken stock, trying to scoop as much floating fat as possible. You can adjust quantities of each ingredient according to taste. To serve you rub a mixture of one tablespoon of sesame oil and one of light soy sauce over the chicken. Then chop it into small pieces. Sprinkle some fried onions on the rice, and serve with pieces of cucumber.